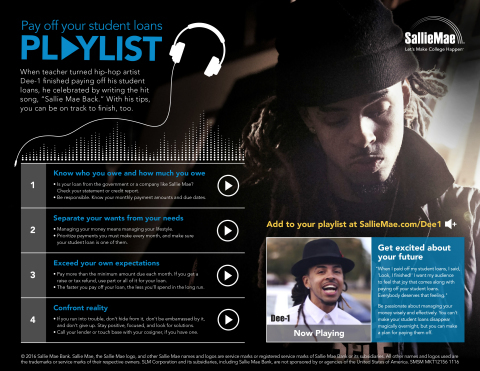 tips, tools, and resources from Dee-1 and Sallie Mae. a total of $95,000 in scholarships. Be responsible. Know your monthly payment amounts and due dates. Managing your money means managing your lifestyle. student loan is one of them. it, and don’t give up. Stay positive, focused, and look for solutions. Call your lender or touch base with your cosigner, if you have one. Get excited about your future! Be passionate about managing your money wisely and effectively. you can make a plan for paying them off. monthly payments by automatic debit. to make loan payments, are now all at a customer’s fingertips. for Paying Down Student Loans” video and visit www.Salliemae.com/Dee1.